At the beginning of summer this past June, after a 6-month hiatus, I started running again on a regular basis. 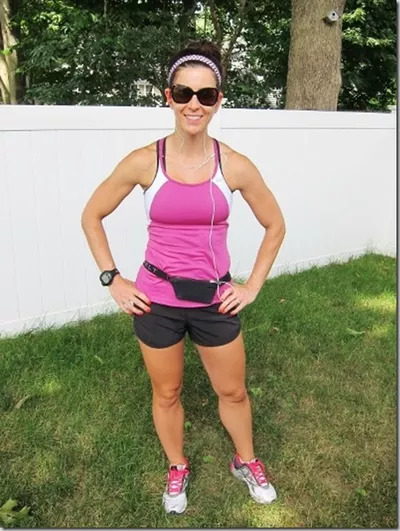 It took me a little while to get back into the swing of things, but once I figured out what worked best for me, especially with regard to summer running, I finally got into a groove and started to see some improvements. Now that the weather is starting to cool down and fall is upon us, I'm taking what I learned this past summer and transitioning it to my fall routine. (I'm training for a half marathon after all!) Here's what I learned from summer running! Early mornings are your friend. Running when the day's temperatures are at their highest is not fun (or safe), so I took advantage of the cool mornings. I have to admit, waking up with the sun wasn't always enjoyable, but beating the heat and getting my run in first thing in the day was key for me sticking with my summer running routine. It's important to hydrate all day long. We all know staying hydrated during workouts is important, but it's even more so during summer workouts. I generally sweat a lot when I exercise, so, this summer, I made it a point to drink extra water before, during, and after my runs, which I noticed helped energize me throughout the day. I also saw an improvement in my performance during workouts. I didn't realize just how much water my body needed until my summer running encouraged me to drink more. It's definitely a healthy habit I plan to stick with! Sometimes, a short, intense workout gets the job done. I usually run in the early morning on cool, shady routes, but, sometimes, it's just too hot. Instead of scrapping my run all together, I started to incorporate more interval-style workouts into my exercise routine. These workouts were typically a mix of running and strength training, but done at a higher intensity and for a shorter period of time than my usual workouts, similar to this 30-Minute, Full Body Running Workout. I pushed myself and worked my entire body, so this way of exercising is definitely here to stay come fall!